Kheer is a milk based pudding made by broken wheat, rice, rice powder, sabudana and vermicelli with sugar. It is flavored with sffaron and cardamom powder and chopped nuts. Kheer can be made for any festivals. 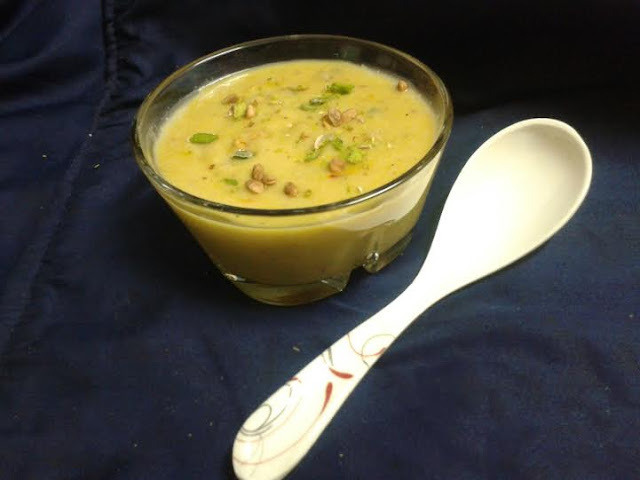 I'm sharing one of my recipe of Besan ki Kheer which is quite simple to make. It's made from chick peas flour and it is delicious. It's mainly made of Punjabi black chickpeas flour but here I am using normal gram flour. Add ghee in a heavy heating bottom pan. Roast the gram flour until a good aroma emanates. Take care while heating to avoid burns. Switch off the flame and add water. Mix well. Make sure there are no lumps of flour in it. Turn on the heat. Add milk, chopped nuts, sugar and cardamom powder. Allow them to boil for 10 to 15 minutes. Switch off the flame. Garnish with nuts. Serve hot or chilled .